This week’s decision by the US Supreme Court to allow corporations, including unions, to hold full rights to free speech and political action under the First Amendment to the Constitution once again reminds me of the strange practical and ethical relationship we have with corporations. In the 1886 ruling, Santa Clara County v. Southern Pacific Railroad Company1, the court reporter wrote in a summary: “The court does not wish to hear argument on the question whether the provision in the Fourteenth Amendment to the Constitution, which forbids a State to deny to any person within its jurisdiction the equal protection of the laws, applies to these corporations. We are all of the opinion that it does.” I have not read very much at all about the history of how corporations came to be persons and I will not enter into the disputes about how this came to be. 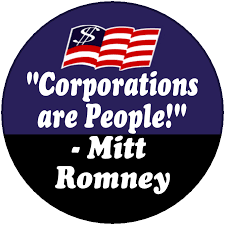 It is clearly a well established fact in our laws that corporations are people. With this new policy handed down by the Supreme Court, corporations can now spend unlimited amounts of money carrying out political activities. The are many troubling aspects of this situation. Besides the obvious fact that an artificial socio-economic artifact like a corporation can not possibly be a natural person, there are numerous features of corporations that make them particularly dangerous to us human beings. Corporations never die, excepting the rare death by dissolution. Corporations act globally with many agents in place to carry out policies that favor the corporation wherever and whenever required. Through the wonders of contracts and financialization of assets corporations can appear and disappear from any locality at will. One can observe an example of this phenomenon several years ago when corporations like Tyco International moved its headquarters to an off-shore island to avoid US corporate taxes. This, despite the fact that Tyco had dozens of manufacturing facilities and other operations employing thousands here in the US. Corporations control far more assets than even the richest of individuals, even whole countries (see the chart below). This means that they have the financial assets to buy anything and anyone they wish. Despite even the protestations of Barney Frank, one of our funniest Congressmen, whose seat is a safe one, it is simply not plausible that he can receive the enormous piles of cash from the financial services industry without him becoming beholden to them. Money is too universally corrosive to support his delusions. What might we do to put corporations in a more suitable position in our society and the world in general? Perhaps we need to follow the same path that those who brought the suit Citizens United v. Federal Election Committee that resulted in the Supreme Court’s ruling. After all, I do not need to pick up the constitution anew to be sure that the word corporation nor business appears in the first amendment. In fact given the position of organizations like corporations during the Founding Father’s discussions leading to the Constitution I am sure that they would never have thought or written approvingly about corporations as natural persons. On the surface then, all we have to do is find an appropriate situation that can bring such an argument before the fundamentalists (literalists, if you like) on the court and it would seem that they would have a hard time justifying even 124 years of precedent. Where are our windmill tilters for this challenge?